Titles are in alphabetical order within each ranking of Difficulty. Difficulty is subjective, but should provide a rough guideline. Rankings are for the harmonica only; accompaniments are not ranked. Samples of the first page of each score may be helpful to determine difficulty. 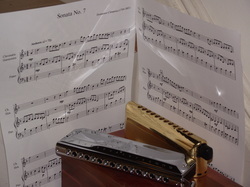 Harmonica lists chromatic harmonica ranges by number of holes|number of reeds. 12|48 spans three octaves, starting with Middle C. 14|56 spans three and one half octaves starting on G below Middle C. 16|64 spans four octaves starting on the C below Middle C. Tenor is a harmonica built an octave below a standard 12|48. Some pieces may be played on a smaller instrument by dropping the octave doublings or playing certain phrases an octave higher. These alternatives are shown in brackets after the recommended size. Pages is a general indication of duration. However, a few of the smaller ones have repeated passages that add to their length.